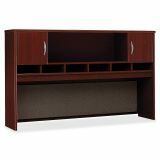 bbf Series C Hutch by Bush Furniture - Series C Collection configures in dozens of ways to create an efficient, affordable, private office environment. Durable, 1 thick melamine surfaces on worksurfaces and end panels resist scratches and stains. Durable PVC edgebanding protects desk from bumps and collisions. Desktops and modesty panels have wire-management grommets for computer cables, telephone cords and electrical wires. Freestanding, mobile pedestals roll underneath any desk shell. File drawers feature full-extension, ball-bearing slides and accommodate letter-size or legal-size files. 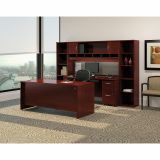 Furniture meets or exceeds applicable ANSI/BIFMA standards."